Garagoa is a municipality in the Colombian Department of Boyacá, part of the the subregion of the Neira Province. It was founded by Captain Gonzalo Jimenez de Quesada in 1539, and was elevated to municipal status in 1809. The flag of Garagoa is horizontally divided red-white-blue and is charged with the coat of arms. "The official flag of Garagoa, as proposed by Councillor José Joaquim Matheus Larotta on 17 December 1967, is made of three equal horizontal stripes, red, white and blue, with the municipal coat of arms in the middle. Red represents love of motherland and an admirative tribute to the heroes who faught for it and shed their blood. White is a symbol of dignity and authority, characteristics of the founders and the suns of the village. Blue represents the sky above us and the abundance of water, source of richness." 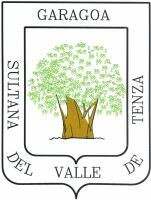 The municipal coat of arms was designed by the same Councillor. It has a golden border with the inscriptions "GARAGOA SULTANA DEL VALLE DE TENZA" and a hundred-year-old ceiba representing authority. There is also a Photograph of the venerable ceiba.